There was a palpable sense of anticipation inside Manhattan’s historic Trinity Church as audiences arrived to hear New York Baroque Incorporated’s (NYBI) premiere of a new edition of the resurrected oratorio Santa Rosalia by Italian organist and composer Bonaventura Aliotti. Originally written in 1687 for a festival celebrating Saint Rosalia, patron saint of Palermo, the work survived only as a manuscript in a private collection for centuries. So NYBI’s performance, with music director Lorenzo Colitto leading an orchestra of 13, simultaneously felt like a glimpse into the past and an exciting world premiere. Aliotti’s score seems to take inspiration from the likes of Monteverdi and Purcell, combining vivid text setting, multifaceted characters, and music of both virtuosic agility and insightful emotion. Throughout, the NYBI orchestra imbued the work with a wealth of instrumental color and conjured vivid imagery with their playing. One striking example came during a scene in which Rosalia etches her vows in stone. Here, Aliotti uses percussive string figures to depict the unmistakable sound of a chisel. Credit also must be given to keyboardist Dongsok Shin and cellist Ezra Seltzer who displayed great artistry in their handling of the continuo accompaniment for recitatives. The oratorio tells a rather simple story. As the title character, a wealthy noblewoman in 12th-century Palermo decides to forsake her worldly station and become a pious hermit, various allegorical figures—Penitence, Ambition, and Sense—vie for influence over her choice. Each character is given ample music with which to make their case, and in the hands of the NYBI soloists, much of it was quite compelling. As Rosalia herself, Dutch soprano Johannette Zomer deftly conveyed the character’s inner struggle. In moments of plaintive yearning, her singing became incredibly lyrical, but Zomer also delivered impassioned passages of fiery fioritura. Her rendition of the aria “Infelice, seguire non so,” in which Rosalia is crippled with indecision, kept with 17th-century stylistic conventions while also being instantly relatable to modern audiences. Molly Netter lent a hauntingly elegant soprano to her performance as Penitence, spinning affecting phrases and skillfully using straight tone. When she returned in the second half as a glorified vision of the Virgin Mary, her singing became more exuberant while still maintaining graceful dignity. Clad in a striking cape and golden earrings, mezzo-soprano Kate Maroney sang the role of Ambition with a rich, penetrating timbre. She excelled at delivering intricate coloratura lines, but, whenever part of an ensemble, she tended to be overpowered by fellow singers. Likewise, tenor Owen McIntosh brought a light—though bright and focused—instrument to his role as Sense. And as Lucifer himself, Dashon Burton sang with a commanding bass-baritone that contrasted nicely with his colleague’s higher voices. NYBI should also be commended for its efforts to make this unknown work accessible for audiences. From a full, printed English translation to simple-yet-effective stage direction by Marc Verzatt, the story unfolded naturally from beginning to end. Hopefully, having had success with this presentation, Aliotti’s Santa Rosalia will no longer be an obscure footnote of musical history. The story of the prophet Jonah, as told through his eponymous book, stands as one of the most fantastical mythologies in the Hebrew and Christian scriptures. Set during the reign of the Jewish King Jereboam II (786-746 BC), Jonah’s story subverts the idea that “what goes around come around” and supplants it with the hope that God’s love and compassion are readily available to those who earnestly seek the path of repentance and obedience. The Book of Jonah was most likely written sometime between the late 5th and early 4th century BCE during a period in which the Jews were led into exile by the brutal Babylonian Empire. This period of exile gave birth to a proliferation of Hebrew writing as Jewish communities sought to secure their history and heritage while they struggled to survive in a strange and foreign land. The story of Jonah commences with God commanding the prophet to proceed to Nineveh (located on the outskirts of modern-day Mosul in Iraq) in order to exhort the people there to repent of their wicked ways. Jonah does the complete opposite, however, and secures passage on a boat sailing in the opposite direction as a means of escaping his emissarial assignment. God unleashes a storm to harass the boat, and Jonah, realizing that his disobedience is jeopardizing the lives of those around him, insists on being tossed overboard. The sailors fling Jonah into the sea where he is swallowed by a giant fish. Jonah spends three nights in the stomach of the fish where he repents for his disobedience. God hears Jonah’s remorse and commands the fish to spit him up on the shore so that he can carry out his mission. Once on land, Jonah goes to Nineveh where the people repent of their wickedness and are spared God’s wrath. The irony of Jonah’s story is that it is his disobedience to God that marries his situation to that of the people of Nineveh. The personified character of Hope in Giona pleads with the people of Nineveh to realize that “Eyes full of tears move to compassion the angered Heaven.” Hope echoes this cadence again to Jonah where it says “Console yourself, oh heart of a sinful man: the penalty of Heaven is not as severe.” In the face of certain destruction, it is only hope that stands before God pleading for the fate of both the prophet and the city. If Hope is the advocate for the haughty, then it is Obedience who instructs them on how to curry favor with the Almighty. Amidst Jonah’s reluctance to go to Nineveh it is Obedience who tells the prophet that “It is not for man to interpret the law laid down by Him who recreated the soul, who holds and sustains them.” After Jonah’s decision to abscond from his duty lands him in the belly of a fish, Obedience and Hope comfort the disheartened prophet by saying, “The Heavens are not harsh and deaf to the supplications of humility.” Obedience advocates for the choosing of God over one’s self and helps individuals to navigate the rocky shoals of their own ego and pride. In tandem effort, Hope and Obedience provide gracious guidance to those seeking the favor and blessing of God. Contemporary audiences might need to hear Hope’s voice in the midst of our contentious national climate. Hope pleads with each of us to strive for goodness and gracious acceptance of the other while believing in our individual and corporate ability to act with justice and kindness. We might also welcome Obedience in our lives as well as we strive to weld our actions to patterns of love shaped by an adherence to Hope’s dream for us all. Each of us faces the choice between allowing our lives to be shaped by love or allowing our existence to be overrun by selfishness and fear. Hope and Obedience beckon us to the former. Like Jonah, we are fortunate to have such noble advocates on our behalf. Rev. Kevin K. Wright is an ordained United Methodist elder and the Minister of Education at The Riverside Church in the City of New York. What are the Jewish Perspectives on the Book of Jonah? The Book of Jonah is read during the services of Yom Kippur, the Jews’ Day of Atonement, because its messages are a fitting inspiration for that time. To understand this scripture, it helps to know the identities of Jonah and the king of Nineveh. According to the Talmud, Jonah was the boy who was resurrected by Elijah (I Kings 17). He grew up as a prophet and a disciple of Elisha. He is the disciple whom Elisha sent to anoint and prophesy to Yehu (II Kings 9:1-10), and he prophesied to King Jeroboam II (ibid. 14:25). By the time of his prophecy to Nineveh, he was about 100 years old. A prophet is liable to death by the Hand of Heaven if he suppresses a prophecy that G-d instructs him to deliver (Tractate Sanhedrin 89a). Why did Jonah do this? He recoiled from being the one through whom a criticism would be brought against his fellow Israelites. The Israelites included ten northern tribes that had separated from Judah and Benjamin, and formed the Biblical nation of Israel. They had then been drawn into idolatry, and although G-d sent prophets to warn them, they had not repented. Jonah knew that if he prophesied to the Gentile city of Nineveh, they would fear G-d, repent to Him and be forgiven. Then G-d would turn to the Israelites and say: “The Gentiles of Nineveh heard My warning from a true prophet and repented, so I forgave their sin. I sent many prophets to you, My nation, but you still refuse to abandon idolatry. Now everyone will know that I am justified in sending the Ten Tribes into exile as their atonement, until the End of Days when I will bring them back” (see Deut. 30). To compel Jonah to obey, G-d first caused him to be willingly cast overboard, thus proving his merit that he cared more for his fellow Israelites than for his own life. Then G-d caused him to be saved by the giant fish that was created for that purpose during the Six Days of Creation (Midrash, Pirkei d’Rabbi Eliezer 10). The Midrash (ibid.) relates that the fish brought Jonah to view the Leviathan (Job 41). G-d will kill the Leviathan when the Messiah son of David comes, speedily in our days, and its meat will be served at the great celebratory feast that G-d will make for the righteous to welcome in the Messianic Era (Tractate Bava Basra 75a). At that time, G-d will remove everyone’s evil inclination, and Jews and Gentiles will dedicate themselves to serving G-d in unity and peace, as it says (Zephaniah 3:9): “For then I [G-d] will turn the peoples to pure language, so that all will call upon the Name of G-d to serve Him with one purpose.” We can see that G-d reminded Jonah about the universal destiny for mankind by bringing him to view the Leviathan. But how was Jonah sure that the people of Nineveh would repent? As he said to G-d after they were spared (4:2), “Was this not my contention…? For this reason I hastened to flee…” The answer lies in the identity of the king. Jewish tradition teaches that he had been the Pharaoh whom we read about in the Book of Exodus (Midrash, ibid. 43). As the exodus took place, Pharaoh stood looking over the Red Sea while it split. When his army was drowned, he finally admitted to G-d’s complete control of the world and repented for his sins. He left and went to Nineveh, where he became king and dedicated it as a “great city unto G-d” (3:3). He was then blessed with long life, but eventually he lapsed and allowed his subjects to sin. Jonah knew that Pharaoh, of all people, would head G-d’s warning and lead them in repenting. After Jonah saw that Nineveh was not destroyed, he was sickened over the comparison with the unrepentant Israelites. To admonish Jonah, G-d provided for him a kikayonplant, which he cherished. The next day it died, which broke Jonah’s heart. G-d then told him, how much more so does He care for all people. For He invests all people with His image (Gen. 1:27), watching them constantly and waiting for them to repent to Him for their sins so they can be forgiven, as proven by the people of Nineveh. There were thousands of prophets in the Biblical Holy Land, but the only prophecies that were canonized in the Hebrew Bible were those which are relevant for all time, as G-d says (Malachi 3:6), “For I, G-d, have not changed…” The Book of Jonah teaches that all people, on account of G-d’s attention and care for them, are obligated to pray to Him to fulfill their needs – including prayers of repentance for their sins, combined with a commitment to actively improve their ways. The author is grateful to Kate Bresee for the editing and useful comments that she provided. Dr. Michael Schulman (PhD Physics ‘88) is an Orthodox/Hassidic Jew who has served since 1999 as Executive Director of the charitable organization Ask Noah International, and its web site Asknoah.org, from which this essay is reprinted with permission. A.N.I. is overseen by leading Orthodox Rabbis in the mission to provide education and guidance to Gentiles in the parts of the Written and Oral Torah tradition that apply universally to all people. Dr. Schulman is co-author of the book Seven Gates of Righteous Knowledge: Spiritual Knowledge and Faith for All Righteous Gentiles. The content of this article is the property of Ask Noah International and does not carry the same CC BY-NC-ND license as the rest of the magazine. I am very pleased to present the first issue of the Academy Journal. It is a major step in the direction of building a community of thought around the music and stories of oratorios. 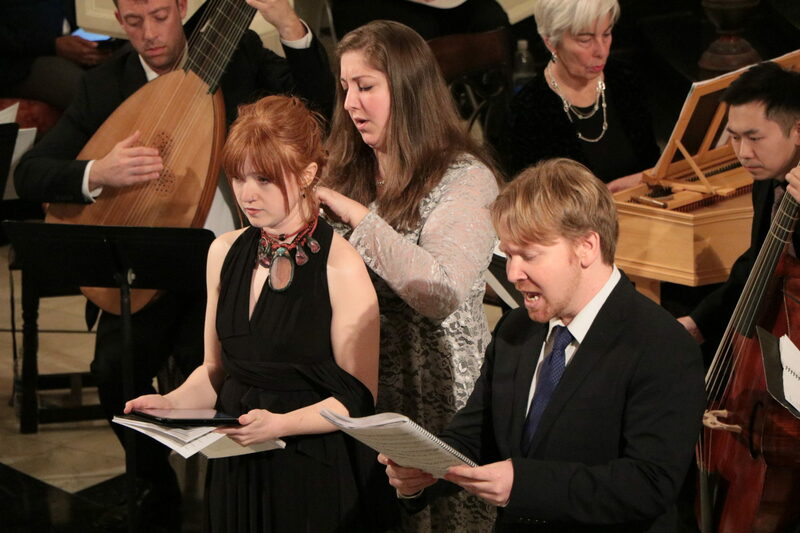 Over the past year and a half, the Academy of Sacred Drama produced Oratorio Readings of five rarely-heard Baroque-era oratorios with the help of 67 volunteers in order to begin to build this community. These were paired with potluck dinners and experiments from a social game built on the story of Susanna to reflections on excerpts from Ishmael. As the Academy community continued to grow, I revisited some of my original goals for the organization including talks by guest speakers and a publication. I originally intended to include talks on contextually related material in place of the sermons that were placed between the halves of many Baroque-era oratorios. The North American Premiere of Giovanni Battista Bassani’s Jonah (Giona) marks a return to this model with a talk by Dr. Eric Bianchi on the intellectual and cultural context for Baroque-era oratorio. The performance of Bassani’s Jonah also launches our Amateur Performance Initiative, in which gifted amateurs have the opportunity to participate in the performance of selected movements of the oratorio. An amateur viola da gamba player will participate in select movements of the first half of the Jonah performance. This is one of five new programs that the Academy now offers its members. Our goal with our membership programs is to unite the abilities and skills of professionals and amateurs of various fields in an effort to shed some light on the largely unexplored world of Baroque-era oratorio. The launch of the Academy Journal is the most visible element of the Academy’s renewal and expansion. It is designed to be a central resource for the world of sacred dramatic music. In order to start to fulfill that function, we are offering a calendar of oratorios and reviews of performances of note. In this issue, Christopher Browner reviews the Modern Day World Premiere of Bonaventura Aliotti’s Santa Rosalia that occurred at Trinity Church, Manhattan on June 1st. The reconstruction and rediscovery of forgotten oratorios is a central component of our mission, and we are excited that New York Baroque Incorporated undertook this project. The second essential part of the Academy Journal is the exploration of the story and themes of Academy Oratorio Readings with articles by members of the extended Academy community. In this inaugural issue, Dr. Michael Shulman explores Jewish perspectives on the Jonah story, and Rev. Kevin Wright approaches themes of hope and obedience in the Jonah story through Christian perspectives. Dr. Ann Plogsterth also offers a narrative on the changing emphasis of visual artists as they sought to depict the Jonah story. And finally, an exploration of this type would not be possible without a clear and intelligently crafted English translation of the original Italian text which until a couple months ago was unavailable. Dr. Elisabeth Pace created the first English translation of the libretto by Ambrosio Ambrossini which was the basis for Bassani’s oratorio. She made it possible for us to undertake this communal and in-depth exploration of Bassani’s Jonah. We call this first issue of the Academy Journal Volume Beta. It is an experiment in which we are trying out a new Academy Journal website, creating the fresh design of a new printed journal, and going through a new editorial process with our gifted editor, Kate Brecee. The Academy Journal will continue to grow and be refined from this point. Be we are excited about its launch and are happy to finally be able to share the fruit of much labor. We hope you enjoy it.